Students networking with employers at CSUN Career Center Open House, Sept. 6, 2017. Photo by David J. Hawkins. 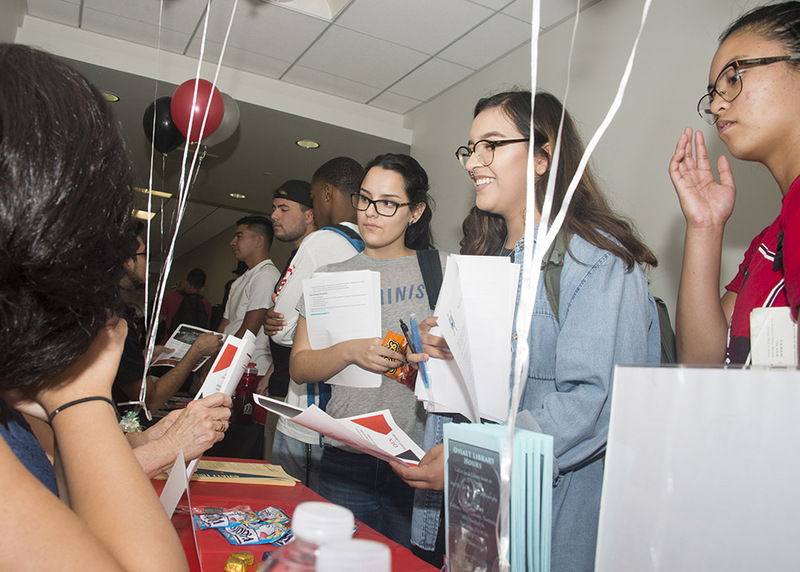 Students finding out about open job positions at CSUN Career Center Open House, Sept. 06, 2017. Photo by David J. Hawkins. Career Center counselors helping students to set up their Sunlink profiles at the CSUN Career Center Open House, Sept. 06, 2017. Photo by David J. Hawkins. 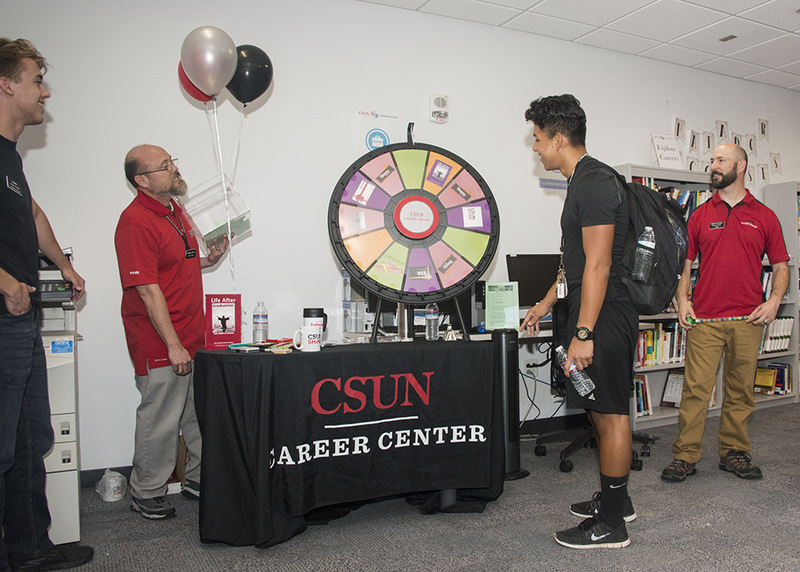 Winning prizes at CSUN Career Center Open House event, Sept. 06, 2017. Photo by David J. Hawkins. 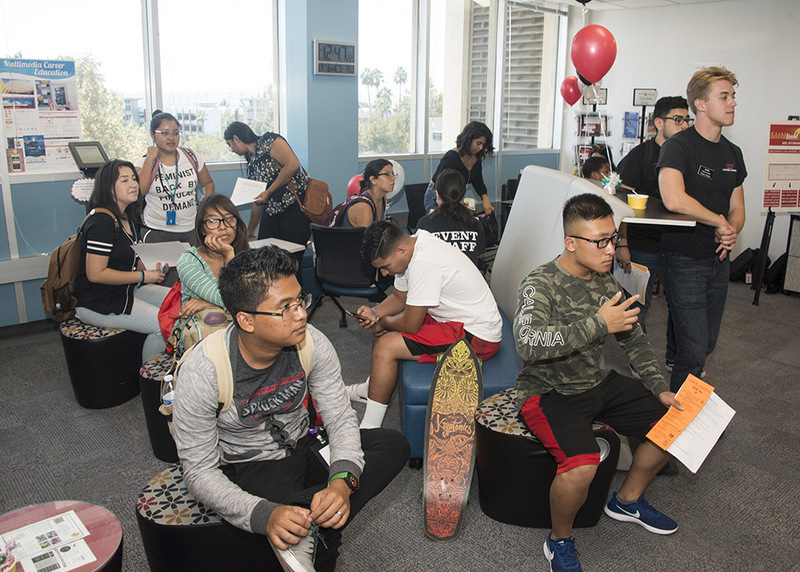 Students participating in the CSUN Career Center Open House event, Sept. 06, 2017. Photo by David J. Hawkins. 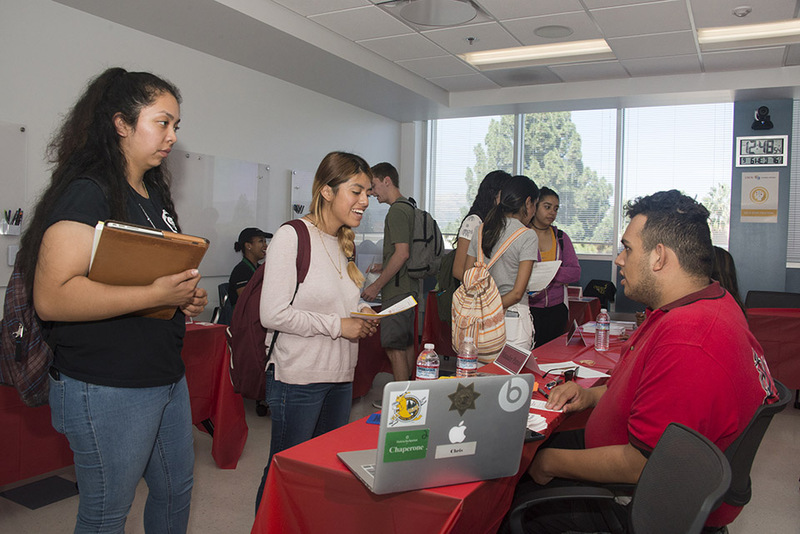 Applicants having the chance to hand in their resumes to employers at the CSUN Career Center Open House, Sept. 06, 2017. Photo by David J. Hawkins. Students on a job hunt got the chance to connect with potential employers at the annual Career Center Open House event, held Sept. 6 in Bayramian Hall. For the 16th year, Career Center staff invited California State University, Northridge students and recruiters to participate in the job fair. Originally, the Open House was a way to acquaint students with the Career Center. The job recruitment portion was a bonus that caught on and has become a major component of this event. 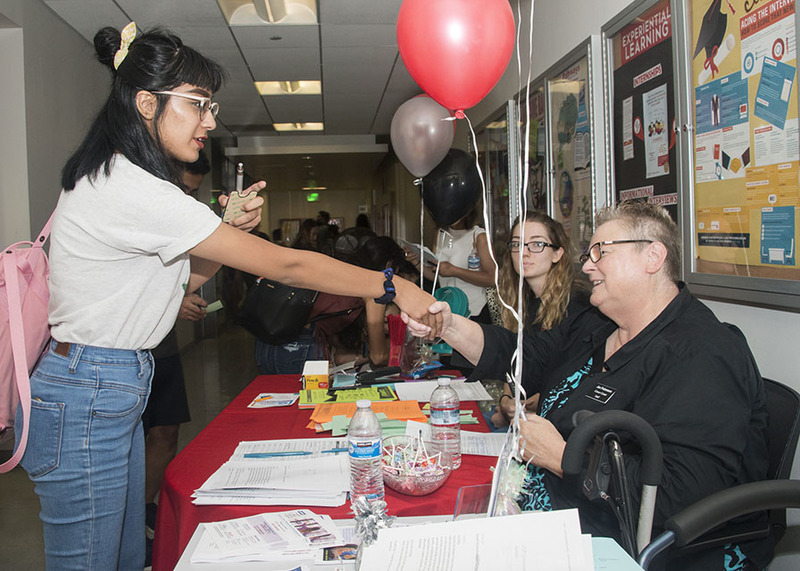 Fifteen recruiters participated in the Open House, among them CSUN departments such as the Department of Family and Consumer Sciences and Disability Resources and Educational Services, as well as off-campus businesses such as Starbucks. Throughout the hallway in front of the Career Center on Bayramian’s fourth floor, employers were set up at booths, giving students the opportunity to introduce themselves, ask questions and learn about open positions. Junior Leo Moneymaker (yes, that is his name) took the chance to fill out an application and hand in his resume. “I have been at the Career Center for a workshop before,” Moneymaker said. “The event today helps me to speak with employers and make contacts.” Junior Clare Calzada came to the job fair seeking a student assistant job on campus. “The event is very helpful — there is a good amount of hiring. I am glad I came,” she said. About 700 students participated in the fair, according to Career Center staff. 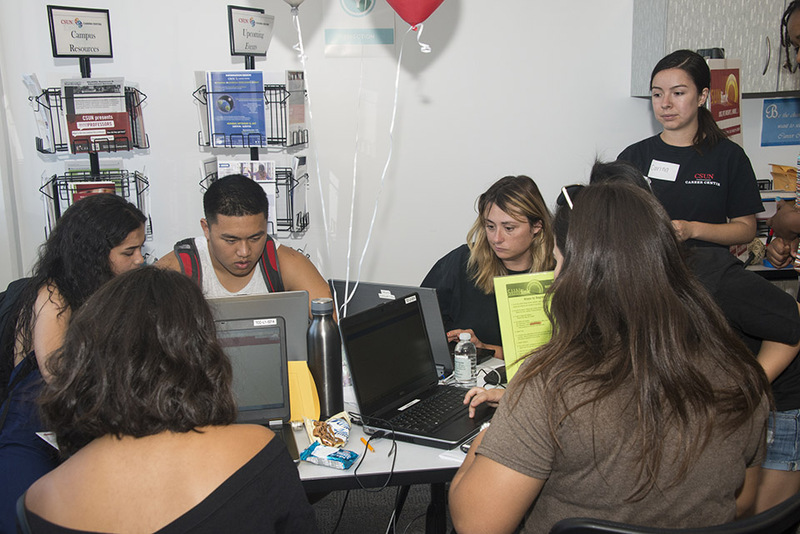 Throughout the day, Career Center counselors offered free workshops on the CSUN job-hunting and resume-building platforms Sunlink, Pathways and Portfolium. “A lot of students do not even realize that with Sunlink we do have our own job posting system,” Gaynor said. “Coming to the fair also helps them to get to know what the Career Center has to offer.” This would include a resource library, computer access, drop-in appointments and counseling help when needed. Open House visitors also learned about the variety of workshops, clinics and events the Center offers. For more information on the Career Center, please click here.